Sheffield researchers discover that silkworms and spiders make silk by pulling rather than pushing, potentially leading to greener synthetic fibres. The discovery could revolutionise how artificial fibres are manufactured, potentially improving both the properties of the fibres and the environmental performance of the industry. Artificial fibres have been produced by industry for close to 80 years, and their manufacture has been dominated by a single method. Fibres are made by squeezing a liquid polymer precursor through a small hole and then exposing the liquid to changes in temperature or further chemical treatment in order to harden it into a solid thread. This has meant that the industry has been characterised by high energy usage and the use of potentially hazardous materials. But the fibres that these filaments are intended to mimic do not require such conditions. 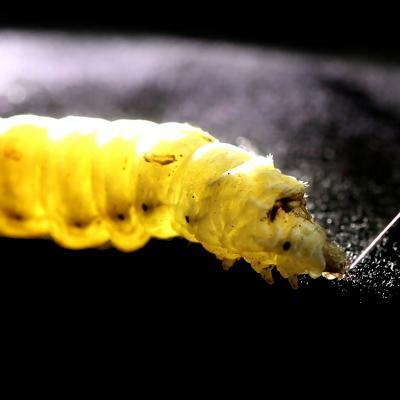 Silk thread, produced by spiders and caterpillars, solidify at ambient temperatures outside the animal’s body and typically don’t require exposure to additional substances, leaving only water behind in the solidification process. The University of Sheffield team, from the Department of Materials Science and Engineering, believe that this might be connected with the physical process of how the fibre is produced. To test this further, the team adapted a rheometer, a device usually used to measure the viscosity of liquids, into a highly sensitive spinning wheel and used it to pull a silk fibre made from the liquid protein mix extracted from silkworms through simulated ducts. “By combining computer models with experimental data and practical measurements, we determined the forces needed to squeeze unspun silk down the animals’ silk gland and spin a fibre,” Holland said. The forces for this process, known as pultrusion, were much lower than those used for extradition, according to the paper.